The original article by Liz Dunphy for the Irish Examiner can be seen here. This is in a country that had some of the worst health and social statistics in the world prior to the conflict. Maternal mortality was high, literacy levels were low, and healthcare was seriously limited. Over 10% of the Yemeni population were classed as moderately malnourished before the conflict. Since the conflict, the dissolution of municipal services, the collapse of private enterprise and a strict UN sanctioned embargo have severely intensified problems of malnutrition. Andre Heller Pereche, head of mission in Yemen and overall director of programmes with Médecins Sans Frontières/Doctors Without Borders (MSF). Outbreaks of water-borne diseases have increased as sanitation standards deteriorate. Dengue fever has already infected urban populations and diarrhoea is wreaking havoc in communities that are already struggling. Rubbish collections are sporadic at best, and access to water and fuel are hugely problematic. “Access to fuel is a major problem,” Pereche said. 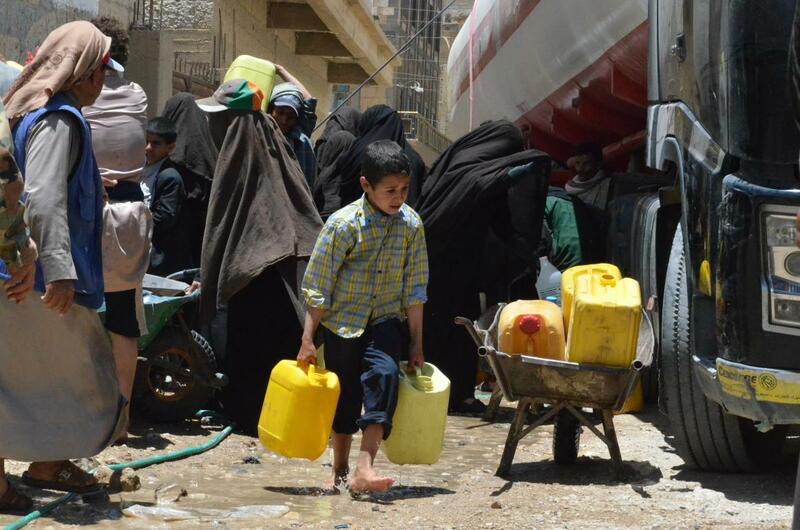 “Yemen has extremely low ground water levels per capita, so fuel is vital to pump water to populations that would otherwise struggle to access it. Vital medical supplies are also limited, meaning people with chronic illnesses like renal failure, vascular disease and diabetes, cannot access medication. Even when insulin is available, the power needed to refrigerate it is often not, rendering the medication defunct. Diabetes is a common condition in Yemen. “What’s happening in Yemen is like Syria in 2013,” says Pereche, who also has extensive experience with the Syrian conflict. The UN-sanctioned embargo is nominally an arms embargo, however due to its wording it effectively bans all trade into Yemen. For a country that relies almost entirely on fuel and food imports, this has been disastrous for civilians. “What is most vitally needed is for Aden’s ports to reopen fully, and for goods to be traded throughout the country again,” Pereche suggests. “However the armed parties to the conflict need to work towards peace for that to happen, and currently their focus is on winning the war, rather than restoring basic services. 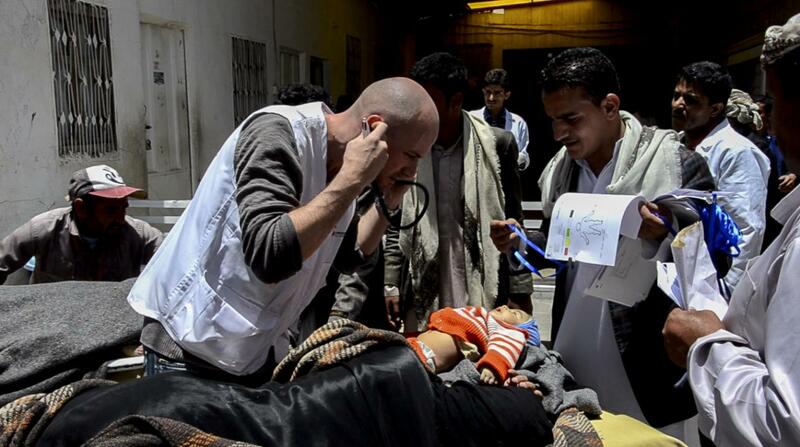 Approximately 50 international MSF workers are in Yemen, and 500-800 locals work with them. Since March, MSF teams have treated over 4,000 patients bringing over 105 tonnes of medical aid. 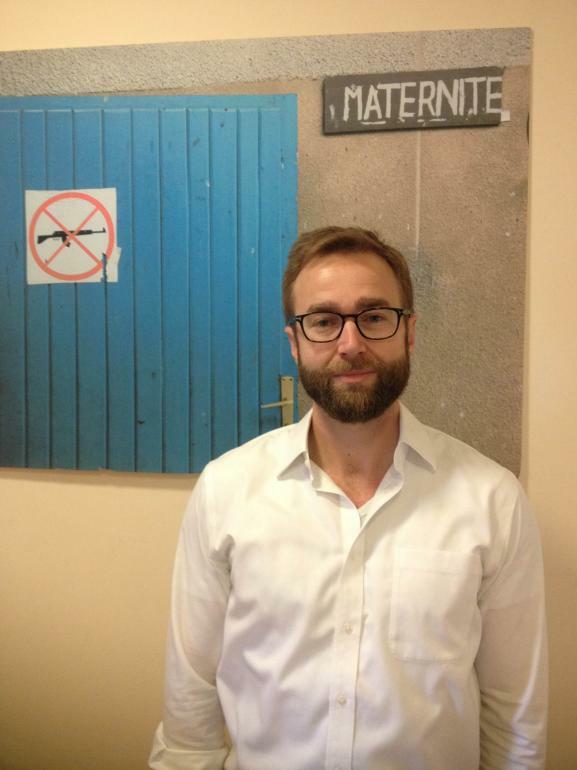 Pereche knows MSF only sees a fraction of those who suffer. “What worries me are all those who cannot access emergency healthcare and are just left to die. As with all wars, ‘collateral damage’, that sickening euphemism, is exacting its deadly toll. The Saudi-led coalition airstrikes often hit military targets, filled with weapons, which cause secondary explosions that send rockets and scud missiles careering chaotically into civilian areas, indiscriminately killing and maiming children and adults, and razing communities. Anti-aircraft fire regularly misses its target and returns to the ground, decimating what lies beneath it, regardless of what side it lands on. The country has endured heavy aerial bombardment. Yemen is home to countless Unesco world heritage sites that are being slowly destroyed; and vital infrastructure, including bridges, hospitals and schools have been flattened. All this in a country once renowned for its beauty and ancient culture. Despite appalling pre-war human rights records and grinding poverty, Pereche remembers a beautiful country on his first visit in 2010 — highlands dotted with old-world stone villages, beautiful ancient medinas, the sparkling Arabian peninsula, and tribal societies that did not harbour secular divides. Since the conflict, secular divides have spawned chasms within communities that once shared neighbourhoods, families and Mosques. “The difference between then and now is like night and day,” he adds.